If you have been following the Anniversary celebrations on Our Daily Bread Designs Blog, you know that today Our Daily Bread Designs is celebrating their 7th Anniversary! Along with the Anniversary celebration, ODBD is releasing TWO Special Edition Commemorative Anniversary stamp sets, God Quotes and God Verses. Today, the design team is showcasing these stamps with a special Anniversary Blog Hop! Continue reading below to see how you can win one of 7 Blog Hop Prizes just for leaving comments on the participating designers blogs! If you haven't had a chance to stop by the ODBD Blog this week, you'll want to check out this post for the Scripture Collection Sale and Blog Hop and this post for the Bread Basket Bundle Sale! I used one of the quotes from the God Quotes stamp set along with ODBD Custom Dies, pattern paper and additional ODBD stamps to create my card. Inspired by this sketch, I used the beautiful Blushing Rose Paper Collection for the background, a few of die cut panels and the butterflies. To create the stamped panel, I inked the Rose Bouquet with markers and stamped onto Vanilla card stock, stamped the quote in Coffee Archival ink and die cut the panel using the Circle Ornament Dies. The stamped panel is layered onto an Espresso pane that was die cut using the Matting Circle Dies. To embellish, I added the Doily cut from Espresso card stock, the Pennant cut from scraps of the pattern paper, layered onto and Espresso panel, along with flourishes cut from scraps, stamped butterflies, seam binding and some Zva Creative Crystal Gems. As you hop, be sure to leave comments along the way for your chance to win one of seven prizes! SEVEN randomly drawn names from the comments left on the designers blogs will each receive one of the new Special Edition Commemorative Anniversary stamp sets. The Hop will run from 8:00 am EDT March 17, 2015 through 9:00 pm EDT March 19, 2015. The winners will be announced on the ODBD Blog on March 20, 2015, so you'll want to be sure to check there to see if you won. I love the design and color combination in your card. Simply beautiful. Super, super gorgeous card, Lisa!! I love the dark brown matting and die cuts against the gorgeous designer paper and how you stamped over the rose image! LOVE this a lot!! HUGS!! Love the colors.The quote is one to keep in the front of our minds at all times.Great card. The colors are spectacular...beautiful job! I love this card. Absolutely love the pink and the dark brown together. Thanks for sharing! A gorgeous card. I love the colors and the fabulous details. Beautiful creation! Love the dk brown with the roses and all the pearls and butterflies! Beautiful! Very beautiful card; so elegant with a beautiful blend of colors. What a lovely, elegant card! Beautiful layout and design Lisa, and wonderful use of the ODBD papers! The dark brown sets off the verse. Love the colors. Beautiful, I just love the stamping of the verse on the designer paper and such a lovely layout and accenting with the brown! Love this card, Lisa! Beautiful colors and the butterflies really set off the quote! Great job! Ahhh Lisa, I always love your artwork! Great attention to detail and lovely layer upon lovely layer of beauty! Great job! Lovely card and colour combination! The black details make the verse really pop! Outstanding card you crafted to share on this 7th year celebration hop! I love the brown as it makes the verse POP! Thank you for sharing! Beautiful and elegant creation Lisa!! I just love the dark matting to frame the dp and on your doily combined with all the gorgeous butterflies and foliage. Beautiful design!! Such a wonderful card! I love the background paper and the butterflies. Simply gorgeous card Lisa! I love this design! Lisa, what a gorgeous card! I especially like your medallion. So pretty. Oh I love the vintage feel of this card Lisa!!!! The pearls and butterflies are perfect!! I love the movement!!!! Hugs!!! Amazing. Spectacular! I love it. Thank you for sharing. Beautiful! Love all the elements and colors. That rose paper is a "gotta' have"! Beautiful placement of elements on your card and love the papers you used. Lisa, these little butterflies are just the sweetest thing on this gorgeous card. It is always good to see your pretty creations. Gorgeous!! Those papers and that lacy die cut is such a beautiful combination. Love the butterflies, too. Simply Beautiful Lisa. I love all of the detail and beautiful paper with that boldness of doily and bow. Amazing combination of embellishments. I really love that sentiment. Again, just simply beautiful. Thanks for the inspiration. I believe that I like your card the best!!! Reflects my style too. Thanks for sharing. Beautiful--I like the flourishes, the butterflies and the doily. I love the design and color combination in your card. Simply beautiful! !! Gorgeous artwork Lisa! So many beautiful details to absorb from colors, layout and pearls! Absolutely gorgeous! Lisa I love the neutral patterns with the hint of color. The flourishes, butterflies and bling are all layed out perfectly and pull the design altogether. What a special card! The layout and paper selections are wonderful! What a beautiful card. I like all the details. Loving those verses. Thanks, Lisa, for sharing your beautiful card. Love this stunning card! I tend to only use doilies in white, but the espresso is such a great look! Just gorgeous! Love it! Have a Blessed day! Lisa, your card is lovely. Absolutely gorgeous, Lisa!!! Love the added butterflies! That pop of black, along with the pearls, just makes this so elegant! I want to do this!! TFS! Your blog name so aptly describes your cards! This one is indeed splendiferous - such gorgeous elements to showcase the verse. Thank you for sharing your talent and inspiring us. Love the way the banner ribbon offsets the card great colors and wonderful Flourishes. Thanks for the opportunity to win one of these awesome sets. This is absolutely exquisite. Perfect in every way! Love the unexpected way you paired the PP and gorgeous embellishments! Beautiful! Beautiful card. Love the warm colors. Hi Lisa! 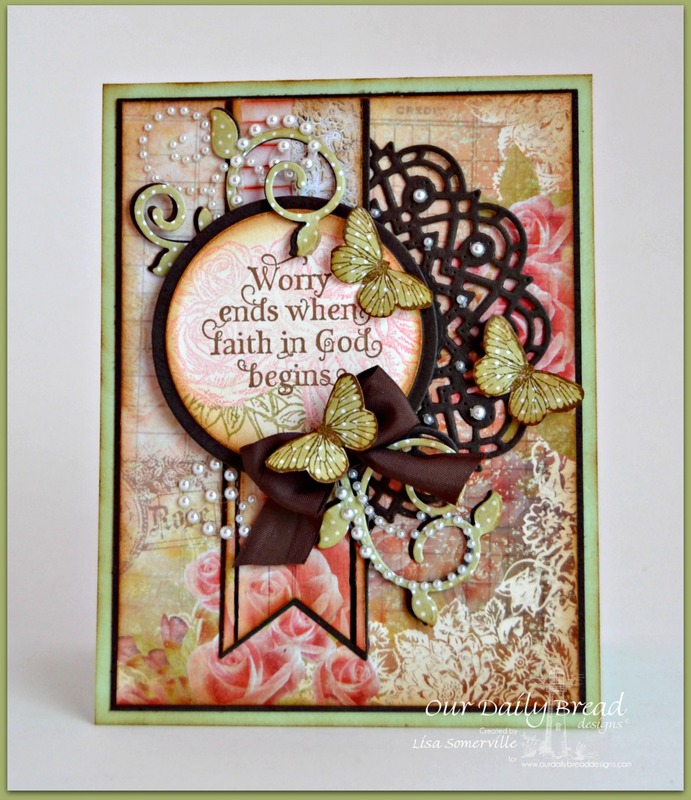 I Love your card, just beautiful use of color contrasts and textures! It so help the bible verse stamp rein as focal point! Just beautiful !! I book marked your blog, I am enjoying reading previous posts!! The dark brown is so striking and classy! Luv your card design - so elegant! Gorgeous card. I love the cardstock you used and the pop of brown. Stunning. I think that paper collection is my new favorite!! You did an amazing job on your card. It is beautiful!! Oh, oh, oh! So rich! This is my most favorite of all! Awesome!! This has to be the prettiest cad you ever made for ODBD! I love it!! Wonderful! Oh, Lisa, this is gorgeous! I love this DP and really love how you've embossed the rose image! Yes, I saw that and really love it! And what a beautiful layout with beautifully arrayed days and embellishments!! I love it completely! Hugs!